The freefish7 mission is to offer positive solutions that allow for a responsible harvest of sustainable seafood and renewable energy which will benefit all mankind while advancing our individual liberty. 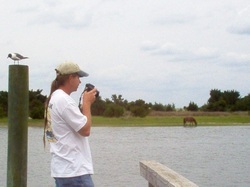 I am Chris McCaffity, a commercial fisherman and photographer from North Carolina who loves the family, freedom, and Country God has blessed me with. Fishing got in my blood as an eleven year old boy working one summer with a neighbor clamming and setting nets. It was great to be out in nature earning money feeding people and doing something I enjoyed. Working on the water gave me a sense of pride and accomplishment while keeping me out of trouble on land. I started working on an offshore charter boat when I was sixteen and fell in love with the thrill of catching big fish and being on the open ocean in all kinds of weather. I worked as a commercial fisherman during the offseason and grew to enjoy that even more. It was just me and a couple of other guys catching fish most people only dream of catching for a few days. We would cook steaks on the grill and look up at the stars that shown so bright while discussing the day’s adventures. I worked my way up to owning a boat and permit through my blood, sweat, and even a few tears. I was living the American dream until a government bureaucracy stepped up their efforts to “help”our fishery. The gross mismanagement our South Atlantic Fishery Management Council unleashed on us was devastating. They used “fatally flawed data” to drastically reduce quotas and refused to properly manage them. This created dangerous derby fisheries that resulted in multiple extended closures and tons of wasted regulatory discards. That compromised our safety as we had to stay at sea longer and in worse weather to catch enough legal fish to pay the bills. A fellow fisherman lost his life as a direct result of the mismanagement. He was fishing on a boat within miles of ours that trip trying to support his little baby girl. That was the final event that forced me to take action. I am responsible for the safety of my crew regardless of the laws we have to follow. I created this website to inform people and try to get public support for common sense solutions that would help our fisheries. You can see some success we have had with the support of good people like you on the Updates page. Knowledge is POWER and we have POWER in numbers. Please consider helping me the way you would like to be helped if the roles were reversed. 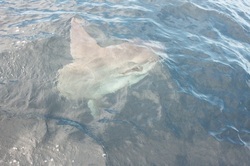 Here are a few pictures of the fish we catch and interesting things we see at sea. One of my fishing partners, Jay with a nice Red Grouper. These delicious fish live around hard bottom and structure on the seafloor in depths between 100 and 300 feet deep. Red Grouper have a four month spawning season closure that requires us to discard any we catch while targeting other species. Projected dead discards are deducted from our quotas. One simple solution is to set a small bycatch allowance of three fish or 50 pounds during the closure. This would be low enough to keep people from targeting them while allowing us to feed people with the ones we accidentally catch. Here is Jay fighting a Gag Grouper that had wedged itself in a rock. The rod broke trying to get him out, but we got him in the boat. Gag Grouper will come into shallow water at certain times of the year. They have the same spawning season as Red Grouper. 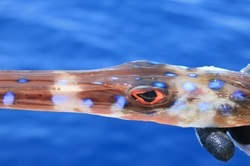 Their quota was filled early last year and the fishery managers are planning ahead for another early closure this year by allocating another 10+tons of quota to dead regulatory discards. The simple solution to avoid the early closure and wasted seafood is to MANAGE the quota with proper possession limits that would keep the fishery open all season. Here is the grouper that broke the rod. 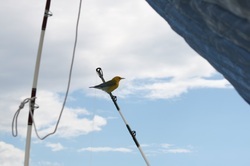 Storms will sometimes push little birds and butterflies offshore. They will land on our boats and rest. We consider it good luck when they visit. We even had a bat land on the boat about 30 miles offshore one time. You never know what you’re going to see at sea. 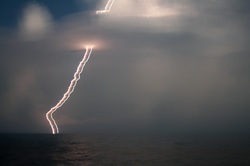 This is a picture of lightning I took during an approaching storm about 60 miles offshore. The moving boat gave it the double strike appearance. We are too far from home to run from these storms, so we just make the best of it. We unplug the electronics, say a prayer, and avoid touching anything metal while enjoying the show.